Despite the nation’s labor participation rate being at its highest level since 2013, there is still a skills gap in America’s largest and fastest-growing industry: health care. Tara Sinclair, a Senior Fellow at Indeed Hiring Lab, explained that this skills gap has been known for a while. Health care workers account for the highest percentage of workers with a license, according to Bureau of Labor Statistics (BLS) data. And registered nurses, practical nurses, and speech language pathologists are just some examples of occupations that need extensive certification. Employment in the health care sector is projected to grow 18% by 2026, “much faster than the average for all occupations, adding about 2.4 million new jobs,” according to BLS. This is mainly attributed to an aging population in greater demand for these services. The demand isn’t going anywhere, either. A study conducted by HR consulting firm Mercer indicated that the U.S. will need to hire 2.3 million new workers by 2025 if it wants to keep up with the country’s aging population. Certain health care jobs are in higher demand than others. 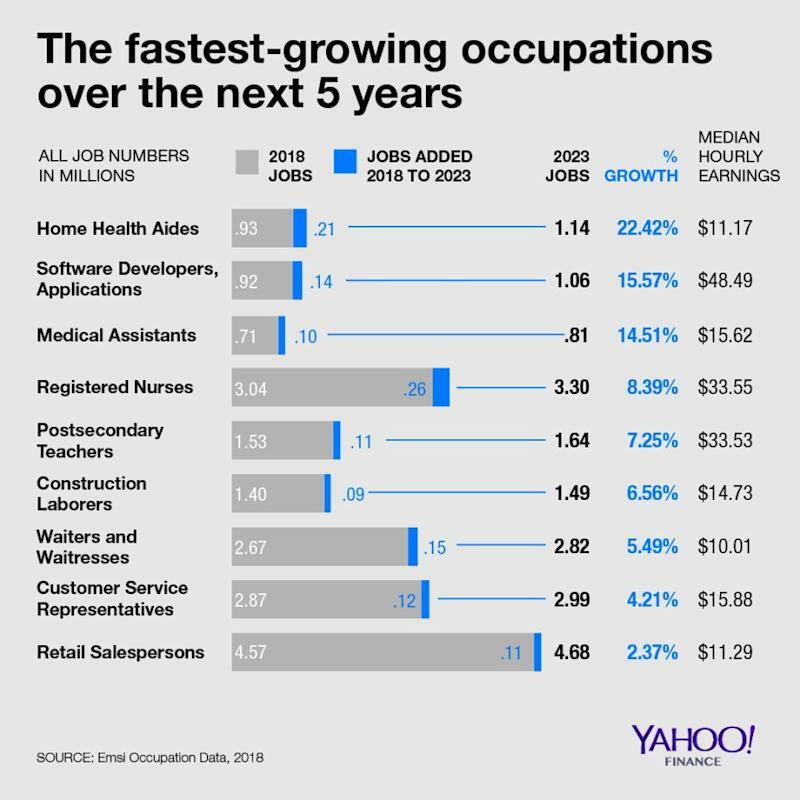 There is an increased need for licensed practical nurses, pharmacy technicians, and nursing assistants while there is a decrease in the number of needed occupational therapists, physical therapists, and pharmacy assistants. Although the basic solution would be to find more ways to train more people, Sinclair noted how difficult that can be for people. With health care experiencing a greater skills gap than the rest of the economy, “it means we’re potentially going to be facing a larger skills gap going forward, unless we can find a way to offer more opportunities for training, getting the certification we need for health care, and perhaps innovating using technology,” Sinclair said. And while automation will replace certain jobs, that is not necessarily the case for health care — even though that might be a good thing for shrinking the skills gap. Adriana is an associate editor for Yahoo Finance. Follow her on Twitter @adrianambells. Follow Yahoo Finance on Twitter, Facebook, Instagram, Flipboard, LinkedIn, YouTube, and reddit. Can Health Care Recover from Medicare for All? Should You Worry About Scanship Holding ASA's (OB:SSHIP) CEO Pay?